Smaller than blackbirds, with a short tail, pointed head, triangular wings, starlings look black at a distance but when seen closer they are very glossy with a sheen of purples and greens. Their flight is fast and direct and they walk and run confidently on the ground. Noisy and gregarious, starlings spend a lot of the year in flocks. Still one of the commonest of garden birds, its decline elsewhere makes it a Red List species. The Starling is sometimes regarded as a bit of a pest in both town and country but around 1800 it was virtually extinct in Scotland. It had spread throughout Britain by the middle of the 20th century and today can still be seen in enormous flocks particularly in autumn and winter. It is at this time of year (August to March) that resident British birds are joined by migrants from north and north-east Europe. 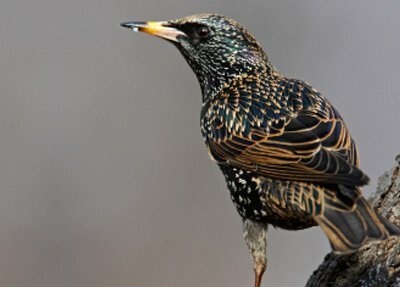 There is now some concern that numbers of starling are declining steeply and BTO surveys show that numbers in Britain have fallen by about 66% since the 1970s. This is largely due to the changing agricultural landscape with less permanent pasture and mixed farming reducing the supply of earthworms and leatherjackets on which the Starling feeds. All wild birds, their eggs and nests are protected under the Wildlife and Countryside Act 1981; under this Act birds cannot be taken or killed, nor their eggs or nests (when in use or being built) be taken or destroyed except under licence. An “individual” licence is granted by DEFRA to approved, named individuals, to tackle a specific problem, within a specific period of time, in an agreed manner. DEFRA assess applications on a case by case basis. Without a licence it is illegal to kill starlings. Starlings are protected by the Wildlife and Countryside Act 1981. Even if the birds are causing damage to property or other problems such as noise or odour they cannot be killed. Failure to comply with the 1981 Act can result in a fine of £5,000, a custodial sentence of 6 months, or both. If you suspect you have a starling problem, call us for more advice on 01992 763776.